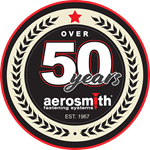 Aerosmith is an Industry leader in high speed, pneumatic fasteners and systems. Wherever traditional fastening (screws, nails, bolts, rivets, crimps, spot welds, to name a few) is used, Aerosmith brand pins have demonstrated exceptional productivity leaps featuring installation that is 7-10 times faster. To learn how much you can save on a specific project by using Aerosmith, check out the Aerosmith Labor Calculator. Even using our very conservative assumptions, you'll see significant saving.